I am running way late on today's post because Marlie and Me are still recovering from our day of fun at daddy's office yesterday. I will be posting pics of us in costume on Sunday (the new location of Baby Log). Today's Friday Flashback is dedicated to us...as in me and my husband. 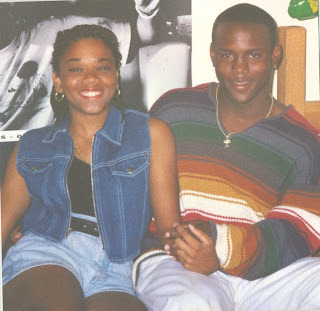 This photo was taken in his dorm room in 1995 when we just started dating (check out our gear! eeks!). Who could have predicted that 14 years, 4 college degrees, 2 engagements, 1 fabulous wedding and honeymoon, 4 vacations abroad, and 3 cities of residence later that we'd be the happy parents to 1 beautiful little girl! Don't forget to enter the 100 Followers Challenge Giveaway! I love it!! Isn't it wonderful how life just transitions into something more and more beautiful with time. Marlie is the perfect reflection of you and hubby's love for each other. God is good, ain't He?!! Nice spot you got here. You guys look cute, and so young. :) I'm stopping in from SITS, and added myself as a follower.